Copy to pasteboard: Copies your track’s unique Spotify URL. You can then paste that URL into a web form or other text box, like you would with any other text on your iPhone, by selecting the text box and tapping Paste. 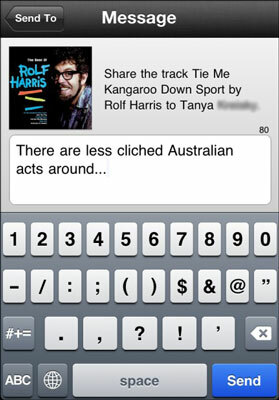 Email: Tap this option, and immediately a new e-mail message appears, with the track’s Spotify URL automatically displayed, as well as album artwork in the body of the message. You can edit the subject and body text to suit you. Send to Spotify People: You can send tracks to anyone in your People list, and even send them an accompanying message, just like you can with the desktop app. Just tap this option, and then tap the person to whom you want to send the track. If you’re familiar with iPhones, you know that when going backward through pages you’ve visited, you need to tap the top-left button of the screen you’re currently in. So, even though this button says Send To, it’s referring to the title of this page. You need to use the blue Send button at the bottom-right of the screen. Share to Facebook: Clicking this link brings you to the Facebook login page, where you can then paste the link as a status message, along with any accompanying words of wisdom. Share to Twitter: Selecting this option brings you to a Twitter login page. The track’s URL automatically gets pasted into your status update box; you can edit any accompanying text, as necessary, before you post your tweet.